We have ourselves a new international TV trailer for Venom, which gives us a fresh look at the villain Riot. With the release coming up fast, Sony Pictures has been ramping up the marketing for what they hope will be the start of their very own comic book cinematic universe. But before they can press on with those plans, they've got to see if fans will embrace Tom Hardy's Venom in a world that won't feature Tom Holland's Spider-Man, nor will it be in any way connected to the Marvel Cinematic Universe. That's unquestionably an uphill battle to fight, but based on this new footage, they've certainly thrown a lot of money and talent at the movie to try and make it work. We first glimpsed Riot during San Diego Comic-Con, but footage of the other symbiote who will be duking it out with Venom has been somewhat scarce. This gives us a pretty solid look at the character, which is cool for those who are already planning on checking this movie out. Is it enough to sell those who are on the fence? Probably not. Venom will center on Eddie Brock, an important figure in the Spider-Man comics over the years who was previously played by Topher Grace in Spider-Man 3. Brock is attempting to revive his journalism career and decides to investigate the Life Foundation, which proves to be a bad decision. He comes into contact with an alien symbiote that bonds with him and becomes a part of his personality. Hence the "we are Venom" tagline. Brock winds up with incredible powers, but he's more or less at the mercy of the symbiote when it takes over. Sony cut a deal with Marvel Studios to allow Spidey to appear in the MCU. However, they were left with literally hundreds of supporting characters from the Spider-Man universe. So, the studio has decided to try and make use of those characters. The plan is to give some of these characters their own solo movies that mostly stand on their own, with the possibility for crossover down the line. If Venom goes well, they have plans for Morbius the Living Vampire, Nightwatch, Black Cat, Silver Sable and Kraven the Hunter movies, which are at various stages in the development process. Jared Leto is attached to star as Morbius the Living Vampire in that project, assuming the studio decides to move forward with it. Tom Hardy previously revealed that he signed a three-picture deal. So he's obligated to return of this does well. 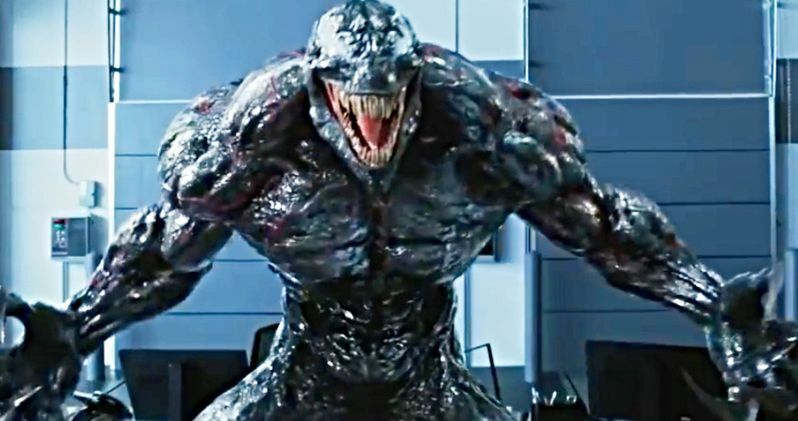 Director Ruben Fleischer also is open to coming back and has teased plans for She-Venom and fan-favorite Carnage. The cast also includes Michelle Williams, Riz Ahmed, Scott Haze, Reid Scott, Jenny Slate, Ron Cephas Jones, and Woody Harrelson. Sony is set to release Venom in theaters on October 5. Be sure to check out the new international TV spot for yourself below.